Grouping up can be fun. As a family or a team, competing or just getting together, adding a fun and common element can connect the group. This winter, it was temporary tatoos. With three generations, and an age range of four years to sixty-somethings, we went with the four-year-old’s choice. 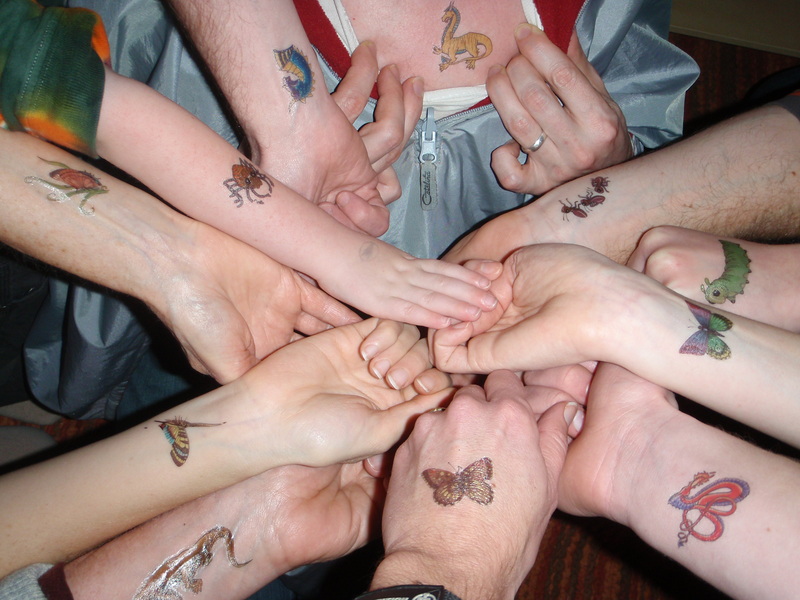 He picked out an insect or other animal character for each of us (individuality!) but everybody got one (team spirit!). We laughed and had fun with it, and I’m reminded of other team times. Take (1) a multi-aged group (2) outside for the fun, fitness, personal and environmental connections of do-it-yourself outdoor adventure. Think big and create a multi-day kayaking, bicycle touring, or backpacking trip. Or start small and walk to your nearest natural area. That's it! Laural Ringler is a backpacker, bicyclist and sometime kayaker, with a family who enjoys much of the same. She is a regular contributor to Adventures Northwest Magazine and has published over 80 articles, many on the intersection of parenting and adventuring. Her family adventure stories blog can be found at lauralringler dotcom and you can reach her at ringlerwrites dot gmail dotcom.